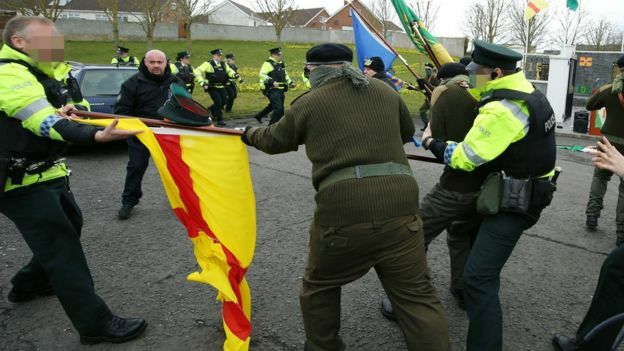 “The annual Easter Rising commemoration took place along the Levin Road at 1pm on Saturday, and involved eight people dressed in paramilitary-style uniforms and wearing masks. [The Easter Rising (Irish: Éirí Amach na Cásca), also known as the Easter Rebellion, was an armed insurrection in Ireland duringEaster Week, April 1916. The Rising was launched by Irish republicans to end British rule in Ireland and establish an independent Irish Republic while the United Kingdom was heavily engaged in the First World War. It was the most significant uprising in Ireland since the rebellion of 1798, and the first armed action of the Irish revolutionary period. [The Irish Republican Brotherhood (IRB; Irish: Bráithreachas Phoblacht na hÉireann) was a secret oath-bound fraternal organisationdedicated to the establishment of an “independent democratic republic” in Ireland between 1858 and 1924. Its counterpart in the United States of America was organised by John O’Mahony and became known as theFenian Brotherhood (later Clan na Gael). The members of both wings of the movement are often referred to as “Fenians”. The IRB played an important role in the history of Ireland, as the chief advocate ofrepublicanism during the campaign for Ireland’s independence from theUnited Kingdom, successor to movements such as the United Irishmenof the 1790s and the Young Irelanders of the 1840s…. [In 1798 the United Irishmen, which had initially been an open political organisation, but which was later suppressed by the British establishment in Ireland and so became a secret revolutionary organisation, rose in rebellion, seeking an end to British rule in Ireland and the establishment of an Irish Republic. The rebellion was suppressed, but the principles of the United Irishmen were to have a powerful influence on the course of Irish history. 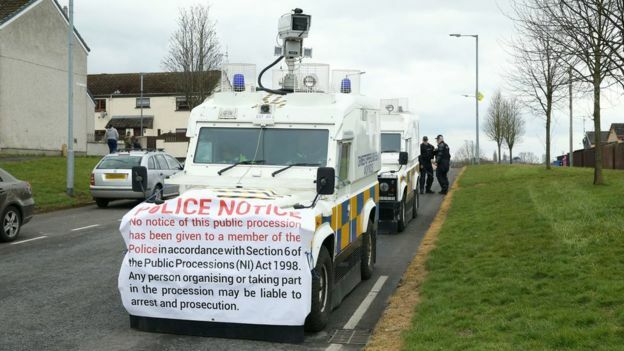 Eight people have been arrested on suspicion of offences under Section 13 (1) of the Terrorism Act 2000 (wearing uniform and carrying items which give cause to believe he or she was a supporter of a proscribed organisation) and taking part in an un-notified procession under Section 6 of the Public Processions (NI) Act 1998. 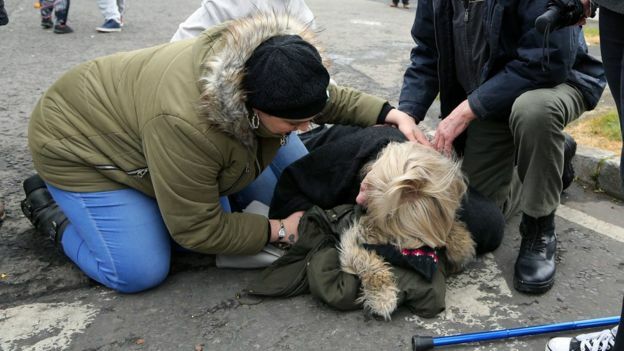 The ninth person was arrested on suspicion of assault on a police office and obstruction. Police have confirmed a woman was injured during the disturbance and was taken to hospital. On Twitter, Sinn Fein MLA Gerry Kelly wrote: “I have always said that commemorations need to be open, respectful and dignified. However I am concerned that an elderly woman has been injured in the Lurgan incident and I have raised this with senior police this evening. 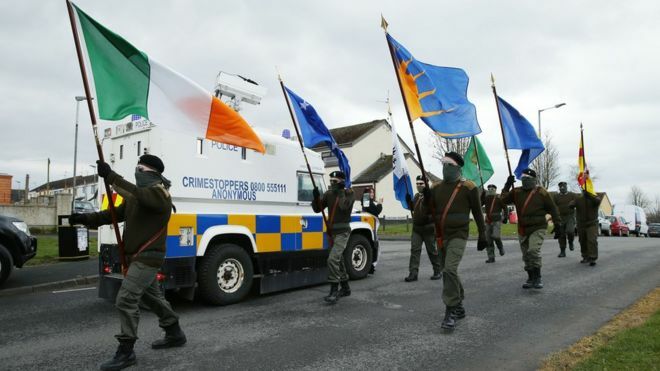 Chief inspector Jon Burrows said: “Those who engage in un-notified parade wearing masks and paramilitary-style uniforms do not represent the majority of people who live in north Lurgan, indeed many of those who participate in this event every year are not from the local community and do not live in Lurgan. “There have been similar parade in previous years organised by the same group and repeated prosecutions for related offences. Police have attempted to engage with members of this group advising them to comply with their illegal responsibilities in relation to processions. CI Burrows added that a woman had been injured during the incident and had been taken to hospital, and that enquiries are ongoing. DUP MLA Carla Lockhart has praised the efforts of the PSNI for their efforts in dealing with parade participants. Mrs Lockhart said following appeals from unionists and nationalists police had acted to stop the parade. “I very much welcome the police operation to stop this illegal parade and glorification of terrorists. I hear plenty of comments from republicans on legal Orange parades but they are strangely silent when republicans decide to march whenever they want glorifying terror in an illegal march,” she said.